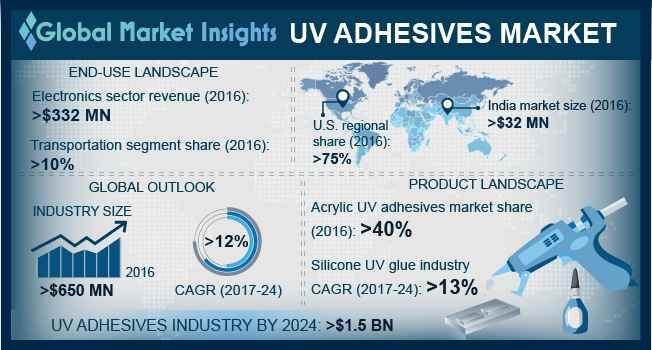 UV Adhesive Market size will surpass USD 1.5 billion by 2024; according to a new research report by Global Market Insights, Inc.
Electronic industry plays a noteworthy role in UV adhesives market as they are used in assembly and circuit protection in electronic appliances. These electrically insulated glues are designed for various operations such as encapsulation, bonding, keyboard coating masking, conformal and optical display bonding & lamination. Global electronic market size is likely to exceed USD 2.5 trillion by the end of forecast period. Asia Pacific deemed to be profitable region for electronic industry and will have a substantial growth rate above 7% in 2016. Factors such as increasing level of income, urbanization, product innovation, rise in share of organized retail will flourish the Indian electronic market. This will the upscale the use of product market in next seven years down the line. Increasing manufacturing industries will demand for more high-tech machineries and equipment which will enhance the industrial assembly sector. This, in turn propel the demand of product by 2024. Europe manufacturing sector generated the revenue above USD 2 trillion of value added in 2014 and will grow with significant growth rate by the forecast timeframe. Other sector such as packaging, building & construction industry will also increase the product demand. Companies such as Dymax corporation provide UV curable adhesive for plastic packaging which form structural bond to PVC, PET, etc. when exposed to UV radiations. High equipment and manufacturing cost of product will compel the end-user manufacturers to use the low-cost adhesives which will encumber the market growth during the forecast timeframe. The special requirement of proper curing system and low curing depth of about 0.5 inch will hinder the product use in end-user industry. UV adhesives are classified on basis of product, end-user and region. Based on product, the market is categorized into epoxy, silicone, polyurethane, acrylic, and others. In terms of revenue, silicone will account for over USD 250 million in 2024 growing at a substantial rate throughout the forecast spell. Silicon is extensively used in medical and electronics owing to rapid curing without heat, providing energy saving and high productivity. These adhesives are converted into solidified bonds without release of water or any solvent which make silicone UV adhesive an endorsed product to be used in medical and electronic industry. Based on end-user, UV adhesives industry is segmented into medical, electronics, transportation, industrial assembly and others. Transportation and industrial assembly will account for more than 22% of the global UV adhesives market share in 2024. These products are used in industrial grade bonding for a variety of materials such as solar panels, thin films, aviation, automobile wood/plastic coatings, etc. Industrial assembly require adhesives that can work in tough and harsh manufacturing environments. This will increase the demand for UV adhesives during the forecast spell. China product market is likely to generate revenue over USD 205 million in forecast spell due to positive growth in electronics industry. Optical and electronic applications are the major industry in China, representing above 30% of the market. The product find application in LCD glass, mobile phones, crystal and glass processing. This will further drive the regional UV adhesives market over the forecast timeframe. Major participants in the UV adhesives market which holds the key chunk include Henkel AG & Co. KGaA, H.B Fuller, Ashland Inc., Dymax corporation, The 3M company, Permabond engineering, BASF SE, Dow corning, DELO, Epoxy technologies, Cartell Ltd., Simco-groups, Excelitas Technological Corp., and Panacol-Elosol GmbH.